Scorsese's unmistakable and ingenious cinematic style this movie has in spades. It's a big-screen movie if there ever was one. It will play on video, but only if you get it in letterbox. Pan-and-scan is completely pointless. Not too many bells and whistles on this disc, but the transfer is gorgeous. The interviews are pretty standard promotional stuff. But the film is worth it. Burned out ambulance driver Frank Pierce inhabits a dark world, literally and figuratively. He works the graveyard shift in one of the ugliest neighborhoods in New York, taking nightly calls on too many drug overdoses, drive-by shootings and suicides -- and after years on the job, it's finally all starting to get to him. He's become an insomniac, and it shows in his swollen, purple eyelids. He hardly eats, sustaining himself on coffee, booze and do-it-yourself, pick-me-up cocktails he mixes from the painkillers in the back of his rig. But more importantly, he's begun to take note of the body count. "I haven't saved anybody in weeks," he sighs in a voice over leaden with exhaustion and self-defeat. Nicolas Cage inhabits this lonely, broken, everyday hero in a way no other actor ever could (save, perhaps, De Niro) in Martin Scorsese's ironically vital masterpiece of mortality, "Bringing Out the Dead." A rigorous, emotionally dense roller coaster of mankind's most fundamental fears and frailties, this is a picture that takes its audience inside the spirit-draining existence of living emergency to emergency and witnessing death every day in a way that makes something as scrubbed and sterile as "ER" feel like playing doctor. The film follows world-weary Frank on three nights of relentless, harrowing calls, each of which increase his fatigue ten-fold as he is haunted by memories of a despondent, homeless teenager he couldn't save from OD-ing six months before. It was her death that triggered his current downward spiral, and it's the openness of another patient's daughter (Patricia Arquette, Cage's real-life wife) that begins to pull him out. Frank assigns his salvation to the dubious survival of her comatose father, visiting him again and again over the course of the film in the nearly forgotten corner of an over-run emergency room. He also takes an interest in the daughter and her well-being, rescuing her from a drug den where she succumbs to old addictions under the stress of her estranged dad's heart attack. In his partners, we also get glimpses of what Frank might have been like before his current bout with disquietude. The first night John Goodman is his shotgun rider, a veteran who hides his own stress under a mask of tiger-by-the-tail enthusiasm. The second night he rides with Ving Rhames, who flirts on the radio with the no-nonsense dispatcher and sees his job as an opportunity to get closer to God. Night three he's behind the wheel with Tom Sizemore as a loose cannon, intoxicated by medical emergencies -- the bloodier, the better. Scorsese doesn't make a single misstep in bringing this intensely layered story to the screen. He directs Cage to an empathetically draining performance while at the same time pumping his film with the kind of obstinate energy that wore Frank out in the first place. Every time a call comes over the radio, "Bringing Out the Dead" upshifts into a dynamic, impulsive, adrenaline rush, brilliantly illustrated by lighting, editing and accelerated photography that takes its cue from the strobing red and blue flashers atop the ambulance. Scorsese is always reinventing these kind of narrative shots that most directors take for granted, and I guarantee you've never seen vehicles with blaring sirens put to such exhilarating use. He also accompanies these emergencies with a blanket of appropriately moody and vivacious soundtrack tunes, from the likes of Martha Reeves and the Vandellas to The Clash to UB40, Van Morrison and 10,000 Maniacs. Adapted from former EMT Joe Connelly's novel by Scorsese's long-time screenwriting collaborator Paul Schrader ("Taxi Driver," "Raging Bull," "The Last Temptation of Christ"), the script is thick with manifold meaning and peppered with stress-relieving black humor. Visually, the incomparable production designer Dante Ferretti ("Kundun," "Interview With the Vampire," "Baron Munchausen") sets up the movie's dark atmosphere. Dense with overt and subtle detail that bring the world of the film so realistically to three-dimensional life, "Bringing Out the Dead" is so potent it uses as asides the kind of developments (a deadly new drug on the street, for instance) that are central to typical, callow movies. 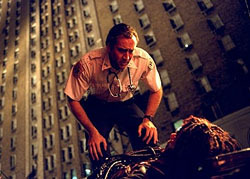 And then there's Cage, as engrossing as he ever was before his inexplicable stint as an action hero, playing with palatable grief and exhaustion this spent soul in the eye of the storm who has gone over in his head again and again a millions reasons to become a civilian, but just keeps plugging away as a reluctant hero. Put this all together, and Scorsese has a created a gripping portrait of the tribulations of inner city medical professionals that stands up to even his best portraits of mob life and serves as something of a contrasting companion piece to "Taxi Driver." This is a whole new kind of Martin Scorsese classic.